St. Peter in Chains, which is not the same as St. Peter's Basilica, is a Roman Catholic church a few blocks north of the Colosseum which houses Michelangelo's spectacular sculpture of Moses, which is part of the Tomb of Pope Julius II. To get to the church from the Cavour metro stop (a 5-minute walk), walk toward the Roman Forum, and watch for the stairway going upward on the left side of Via Cavour (2nd photo below). Walk up the stairway and turn left at the top. 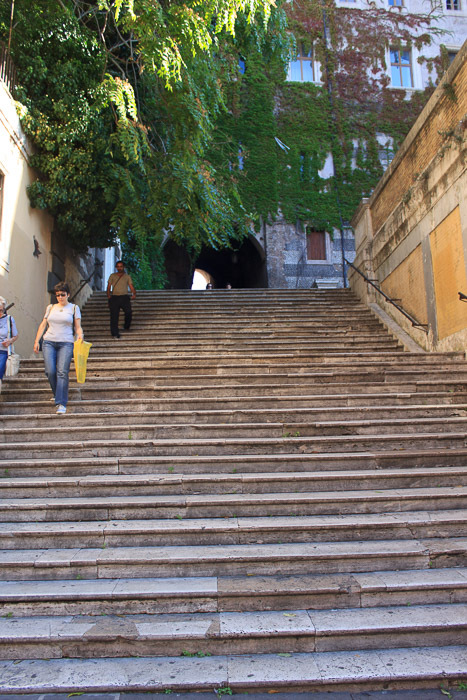 That stairway has historical significance: it was an alley called the "wicked lane" in ancient Rome because it was believed to be the place where the daughter of Servius Tullius, the 6th king of Rome, and the wife of Tarquinius the Proud, 7th and final king of Rome, drove her chariot over the body of her father, killing him, after her husband had siezed power. To get there from the Colosseum or the Colosseo metro station (a 10-minute walk), go up the steps at the left side of the metro station (as you look at the station from outside). 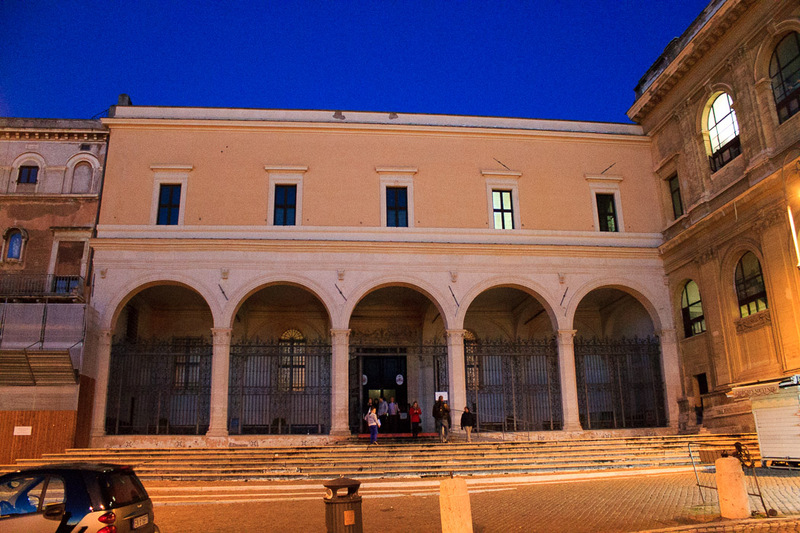 Walk over to the main road which leads away from the Colosseum toward the north. The central part of that road is level, and the outer parts of the road go upward onto a hill. Take the right-most part of the road to head uphill. Turn right onto the first street, Via della Polvenera, which bends to the left becoming Via Eudossiana. That road ends in a piazza (at the top of the steps down to Via Cavour), and the church is on the right side of the piazza when entering it from this direction. See all St. Peter in Chains photos. The highlight of this church, Michelangelo's Moses, completed in 1515, was originally intended to be part of a huge 47-statue free-standing funeral monument for Pope Julius II in St. Peter's Basilica. 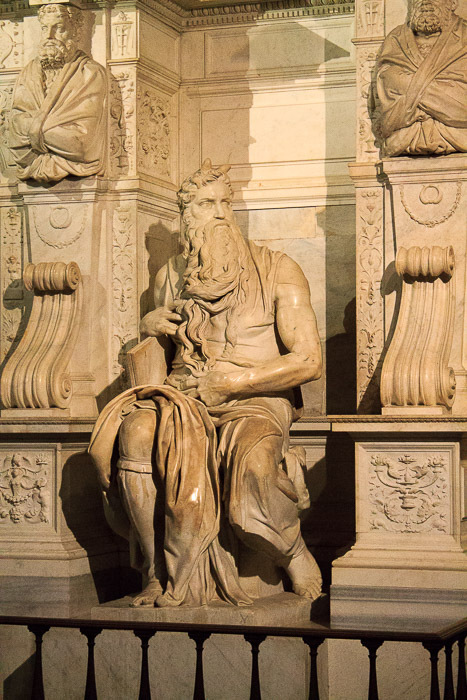 The statue of Moses was to be placed on a tier about 12 feet off the ground, opposite a statue of St. Paul. Instead, when funds ran short, the final design has Moses sitting in the center of the bottom tier, and the final reduced wall-tomb was placed in the church of St. Peter in Chains (1st photo below). 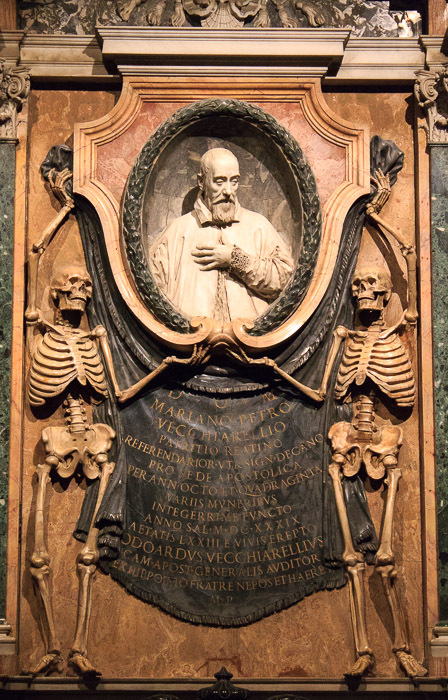 Poor Julius II, not only was his tomb scaled back, he's not even buried in it (he's buried at St. Peter's Basilica). Regardless of any scaling-back of the tomb, the sculpture of Moses (2nd photo below) is among the most powerful the world has ever seen. Seated, Moses rests one arm on the tablets of the ten commandments, while his other arm, with throbbing veins and tense muscles appear to be holding back from violent action. His angry look is directed to his people worshipping the Golden Calf - the false idol they had made - when he came down from Mount Sinai. Moses' head has two horns protruding, as some Bible translations state he had when returning to his people after his conversation with God. He exhibited the "radiance of the Lord", and the similarity in the Hebrew words for "beams of light" and "horns" has led to different translations for this passage. Legend has it that the sculpture produced deep emotions in the artist himself. As he finished it, Michelangelo is said to have struck the right knee of Moses with a hammer and said, "Now speak!". Flanking Moses on the left and right are the Old Testament sisters, Rachel and Leah. Rachel is in a position of prayer, representing the contemplative life, or faith. Leah, on the other hand, represents the active life of good works. 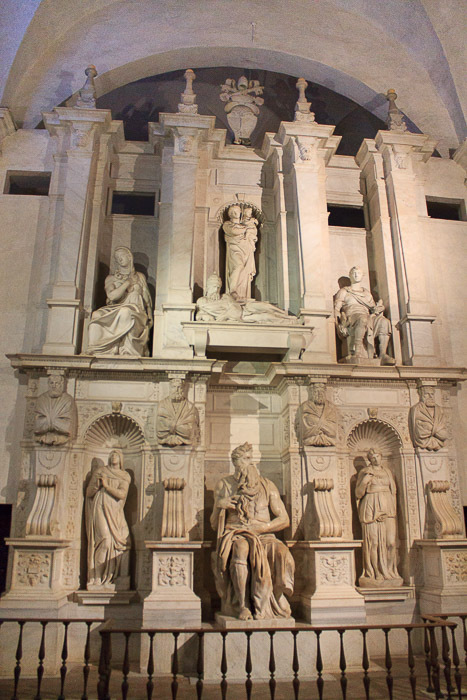 These two statues, along with Moses, are all on the lower tier and are the only ones by Michelangelo. Centered on the second level of the tomb is the rather strange effigy of a reclining Julius II, carved in an Etruscan manner by Tommaso di Pietro Boscoli. Raffaello da Montelupo, one of Michelangelo’s assistants, sculpted the Madonna and Child (centered, above Julius II) and the sibyl and prophet on either side of Julius II. The interior of the church has a nave and two aisles. 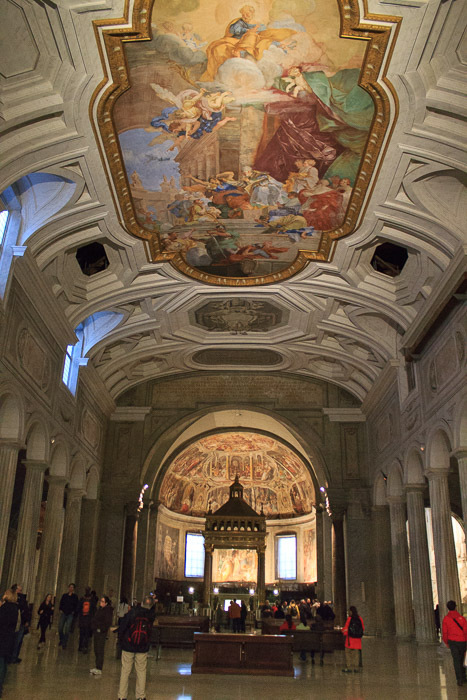 In the center of the nave, the coffered ceiling has an 18th century fresco, The Miracle of the Chains by Giovanni Battista Parodi. And in the requiary under the main altar are the chains that bound St. Peter while he was imprisoned in Jerusalem (Acts 12:1-11), and which an angel caused to fall off his hands, freeing him. Those chains were given to Pope Leo I by Empress Eudoxia (the wife of Emperor Valentinian III). 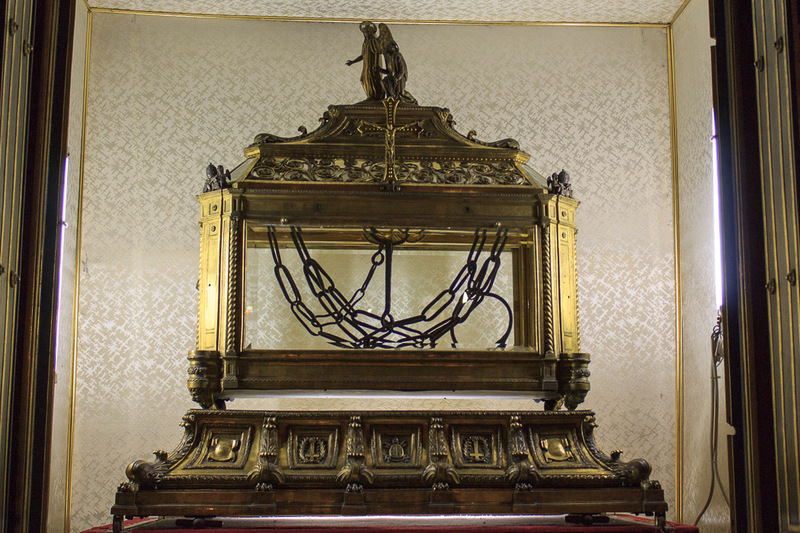 According to legend, when the pope held them next to the chains from Peter's first imprisonment in the Mamertine Prison in Rome, the two chains miraculously fused together, and these fused chains are on display in the church (2nd photo below). The other thing that I find to be cool within this church are the two memorials with skeletons. 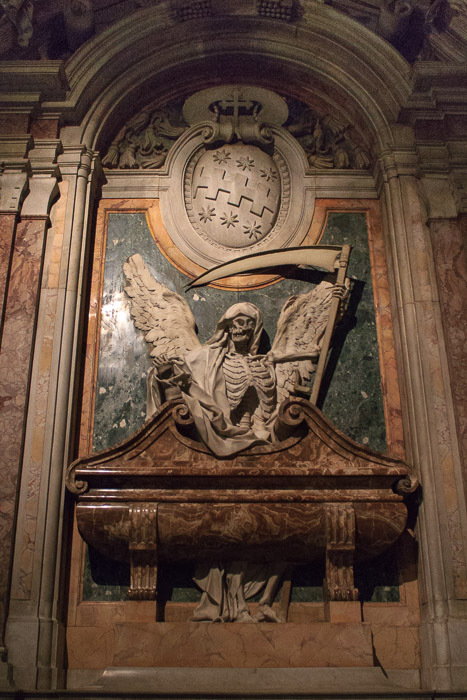 The 1st photo below is the Tomb of Mariano Petro Vecchiarelli, and the even more awesome one in the 2nd photo below is the Tomb of Cardinal Cinzio Aldobrandini, featuring the Grim Reaper. Other interesting nearby sights are the Torre Borgia at the opposite end of the piazza; San Martino ai Monti, with its two towers; Santa Prassede, with its beautiful mosaics and Christ's column of flagellation; and Santa Maria Maggiore, with its mosaics and the Esquiline Obelisk in the back and the Column of Peace and the Fountain of Santa Maria Maggiore in the front.